New motherboard series aimed directly at gamers. 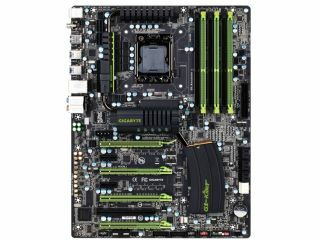 Gigabyte has introduced a new series of three gaming motherboards, known as the G1-Killer series. The killers comprise the G1.Assassin, G1.Sniper and G1.Guerrilla, all of them shown off for the first time at CES. The series is targeted at gamers who make great demands on their computers and require the best and fastest action. Henry Kao, Senior Vice President of Research and Development at Gigabyte, said: "Gigabyte is thrilled to be able to introduce the world's first motherboard series designed solely for elite gamers." "The G1-Killer series features the industry's most advanced hardware and software solutions from Creative and Bigfoot Networks onboard as well as the top-notch quality and durability users have come to expect from GIGABYTE. So, lock and load gamers, the Gigabyte G1-Killer series motherboards deliver a gaming experience unlike any other." All of the Killer boards are based on the Intel X58 chipset and offer solutions from Creative and Bigfoot Networks, in addition to several exclusive features that Gigabyte is currently keeping secret.